UPDATE 3 PM: The text of the MTI doesn’t mention forcing a vote on the Senate bill. 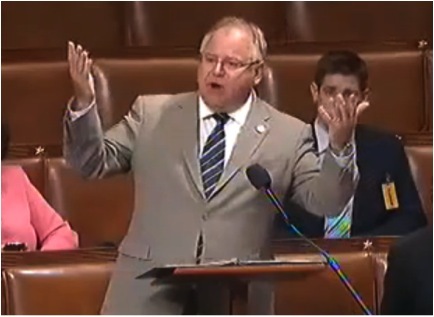 The House is about to vote on a motion to instruct, sponsored by Rep. Tim Walz (D-MN). It’s a non-binding command to the House members of the conference committee to finish their work by June 22 — this Friday. Walz’s motion rejects the current talk of an extension in case the conference can’t come to an agreement. Conference Chair Barbara Boxer said at the outset that her personal deadline was June 7 to finish the work of the conference committee. But almost two weeks later, the committee is still meeting and, according to all reports, still has major points of disagreement. Rep. Walz notes that transportation bills have historically passed in a bipartisan manner with wide margins — SAFETEA-LU passed the House in 2005 412-8 and in the Senate 91-4; TEA-21 passed the House 297-86 and the Senate 88-5 in 1998; IS-TEA was approved 372-47 and 79-8 in 1991; etc. “I will be the first to tell you the prerogative of the House to lead is sacred to us here,” Walz said in a speech on the House floor yesterday. “The problem is, we’ve been sitting in conference committee for 45 days with a deadlock and no end in sight.” Rather than extend the current law if the conference doesn’t approve a conference report by Friday, Walz calls for the House to hold an an up-or-down vote on the Senate bill. The crushing defeat of the Broun amendment to cut transportation funding two weeks ago indicates that the Senate bill could easily pass the House, if leadership would only allow a vote. The text of the motion itself doesn’t require a vote on the Senate bill, although that appears to be Walz’s preference. Another motion to instruct that will be debated later today is West Virginia Rep. David McKinley’s instruction to keep the coal ash deregulation provision in the bill. Also this afternoon, the House is also considering legislation that would force the opening of more public lands to oil drilling and limit the president’s use of the Strategic Petroleum Reserve, as a way to force his hand on increasing oil production. It would also undermine the historic setting of air quality regulations based exclusively on their impacts on public health. This isn’t the only bill the House has introduced to gut the Clean Air Act in exactly this way — it’s clearly a GOP priority in this Congress. House Democrats call it “one big give-away to Big Oil” and the president is threatening a veto. It seems to me that Big Oil and the equally powerful Car Lobby and the Road Builders are all a whole lot more influential than us meek little private city dwellers who need this bill to pass and fund our transportation networks. A classic example of how big money skews priorities in a big way.